This lighted blow mold Santa with Sleigh and Reindeer from General Foam will make a great addition to your holiday décor! The set is made of durable polyresin and is ideal for indoor or outdoor use. During the day, the pearlized white finish of the Santa with Sleigh and Reindeer provides an added interest and glow with painted features to enhance its appearance. At night, the Santa with Sleigh and Reindeer illuminates, creating a holiday season treat for the eyes! The Santa stands at 37 inches tall and the Reindeer stands at 34 inches tall. The set looks great on a front porch or in your yard. This Santa with Sleigh and Reindeer also works well for indoor decorating, so you can create your own winter wonderland! A 4-foot (2-prong) cord is included to help move it into the perfect spot. 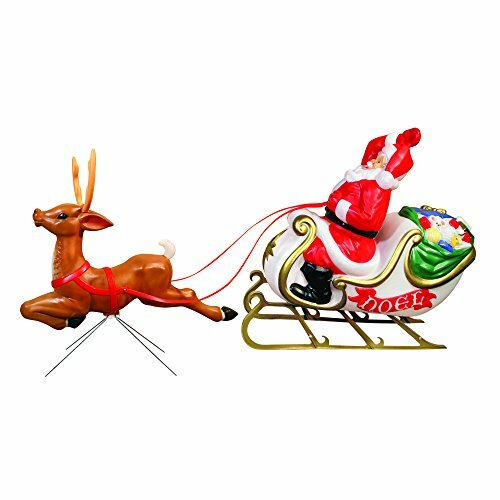 Made in America, this General Foam plastic blow mold Santa with Sleigh and Reindeer will surely light up your holiday for years to come! The Reindeer lights up with type C7 bulb and is connected with a 3-foot power cord (bulb included). The Santa lights up with a standard type A bulb and is connected with a 4-foot power cord (bulb not included).